"Pamplemousse" redirects here. For the location on Mauritius, see Pamplemousses District. For the racehorse, see The Pamplemousse. For the musical duo, see Pomplamoose. "Yòuzi" redirects here. For the fruit also called Xiāngchéng, see Yuzu. The pomelo, Citrus maxima or Citrus grandis, is the largest citrus fruit from the Rutaceae family. It is a natural (non-hybrid) citrus fruit, similar in appearance to a large grapefruit, native to South and Southeast Asia. The pomelo is one of the original citrus species from which the rest of cultivated citrus have been hybridized. The popular fruit is used in many festive celebrations throughout Southeast Asia. After a Captain Shaddock of an East India Company ship introduced it to Barbados, the fruit was called "shaddock" in English. From there the name spread to Jamaica in 1696. It remains a common name for the fruit among English authors. It has been suggested, but not attested, that "pomelo" is an alteration of a compound of English words pome ("apple") + melon. The fruit is also known as jabong in Hawaii and jambola in varieties of English spoken in South Asia. Typically, the fruit is pale green to yellow when ripe, with sweet white (or, more rarely, pink or red) flesh, and a very thick albedo (rind pith). It is a large citrus fruit, 15–25 centimetres (5.9–9.8 in) in diameter, usually weighing 1–2 kilograms (2.2–4.4 lb). Leaf petioles are distinctly winged. The typical pomelo is much larger than the grapefruit, and also has a much thicker rind. It tastes like a sweet, mild grapefruit (believed to be a hybrid of Citrus maxima and the orange). The flesh has none, or very little, of the common grapefruit's bitterness. The enveloping membranous material around the segments is bitter, considered inedible, and usually discarded. Sometimes, the peel is used to make marmalade. It may be candied, or dipped in chocolate. In Brazil the thick skin is often used for making a sweet conserve, while the spongy pith of the rind is discarded. In Sri Lanka it is often eaten as a dessert, either raw or sprinkled with sugar. Some fatty Asian dishes use sliced pre-soaked pith to absorb the sauce and fat for eating. In large parts of Southeast Asia, where Citrus maxima is native, it is a popular dessert, often eaten raw and sprinkled with, or dipped in, a salt mixture. It is eaten in salads and drinks as well. Citrus maxima is usually grafted onto other citrus rootstocks, but may be grown from seed. The fruit is said to have been introduced to Japan by a Cantonese captain in the An'ei era (1772–1781). There are two varieties: a sweet kind with white flesh and a sour kind with pinkish flesh, the latter more likely to be used as an altar decoration than eaten. Pomelos often are eaten in Asia during the mid-autumn festival or mooncake festival. It is one of the ingredients of "Forbidden Fruit", a liqueur dating back to the early twentieth century that also contains honey and brandy. This liqueur is most famously used in the Dorchester cocktail. 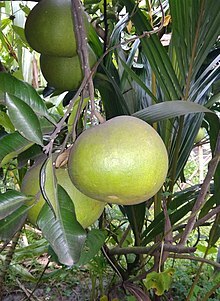 A wide variability was observed in the physical and chemical characteristics of the fruits of various pomelo accessions from Bengal, India. Some medicines may interact dangerously with pomelos and some pomelo hybrids, including grapefruit, some limes, and some oranges. Pomelo leaves are used for aromatic baths. The essential oil can be extracted from the leaves, peel or seeds of some pomelo species. Oil from the seeds of an inferior pomelo species was used to light opium pipes in Indochina. Perfumes are extracted from the flowers using enfleurage. The moderately heavy and hard timber from pomelo trees can be used to make, among other things, tool handles. The pomelo is one of the original citrus species from which the rest of cultivated citrus have been hybridized, (others being citron, mandarin, and to a lesser extent, papedas and kumquat). In particular, the common orange and the grapefruit are presumed to be naturally occurring hybrids between the pomelo and the mandarin, with the pomelo providing the larger size and greater firmness. ^ American Heritage Dictionary, 1973. ^ "Shaddock". Britannica Online. Encyclopædia Britannica, Inc. Retrieved 1 January 2017. ^ "Pomelo", Oxford English Dictionary. ^ "Grapefruit". Hort.purdue.edu. Retrieved 2012-05-12. ^ "Pummelo". Hort.purdue.edu. Retrieved 2012-01-07. ^ "阿久根市： 観光・特産品（ボンタン）". City.akune.kagoshima.jp. Archived from the original on 2011-11-19. Retrieved 2012-01-07. ^ Bhowmick, Nilesh; Mani, Arghya; Paul, Prodyut Kumar; Prasanna, V.S.S.V. "PHYSIO-CHEMICAL PROPERTIES OF PUMMELO [CITRUS GRANDIS (L.) OSBECK] GROWN UNDER NORTHERN PARTS OF WEST BENGAL". Journal of Plant Development Sciences. 9 (9): 887. This page was last edited on 4 April 2019, at 16:52 (UTC).